On June 11, NASA's Fermi Gamma-ray Space Telescope celebrates a decade of using gamma rays, the highest-energy form of light in the cosmos, to study black holes, neutron stars, and other extreme cosmic objects and events. "Fermi's first 10 years have produced numerous scientific discoveries that have revolutionized our understanding of the gamma-ray universe," said Paul Hertz, Astrophysics Division director at NASA Headquarters in Washington. By scanning the sky every three hours, Fermi's main instrument, the Large Area Telescope (LAT), has observed more than 5,000 individual gamma-ray sources, including an explosion called GRB 130427A, the most powerful gamma-ray burst scientists have detected. In 1949, Enrico Fermi—an Italian-American pioneer in high-energy physics and Nobel laureate for whom the mission was named—suggested that cosmic rays, particles traveling at nearly the speed of light, could be propelled by supernova shock waves. In 2013, Fermi's LAT used gamma rays to prove these stellar remnants are at least one source of the speedy particles. Fermi's all-sky map, produced by the LAT, has revealed two massive structures extending above and below the plane of the Milky Way. These two "bubbles" span 50,000 light-years and were probably produced by the supermassive black hole at the center of the galaxy only a few million years ago. "The astronomy of gamma rays is the science of extremes," said Julie McEnery, the Fermi project scientist at NASA's Goddard Space Flight Center in Greenbelt, Maryland. "Extreme gravity, extreme magnetic fields—Fermi has opened a window on to some of the most interesting physics and structures in the universe." The Gamma-ray Burst Monitor (GBM), Fermi's secondary instrument, can see the entire sky at any instant, except the portion blocked by Earth. The satellite has observed over 2,300 gamma-ray bursts, the most luminous events in the universe. Gamma-ray bursts occur when massive stars collapse or neutron stars or black holes merge and drive jets of particles at nearly the speed of light. In those jets, matter travels at different speeds and collides, emitting gamma rays. On Aug. 17, 2017, Fermi detected a gamma-ray burst from a powerful explosion in the constellation Hydra. At almost the same time, the National Science Foundation's Laser Interferometer Gravitational-wave Observatory detected ripples in space-time from the same event, the merger of two neutron stars. This was the first time light and gravitational waves were detected from the same source. Scientists also used another gamma-ray burst detected by Fermi to confirm Einstein's theory that space-time is smooth and continuous. The GBM has also spotted over 5,000 terrestrial gamma-ray flashes in Earth's atmosphere associated with thunderstorms, as well as particles of antimatter those flashes can produce. "Fermi has fundamentally improved our understanding of how the universe operates," said David Thompson, a Fermi deputy project scientist at Goddard. "This spacecraft has both provided evidence for long-cherished theories and has also forced the scientific community to reevaluate some of its assumptions." But space can be a difficult working environment. On April 3, 2012, Fermi dodged a potential collision with Cosmos 1805, a defunct Soviet Cold War spy satellite, when the team fired Fermi's decommissioning thrusters to move it to safety. Fermi experienced its first hardware failure on March 16, 2018, when one of its solar panels became stuck. 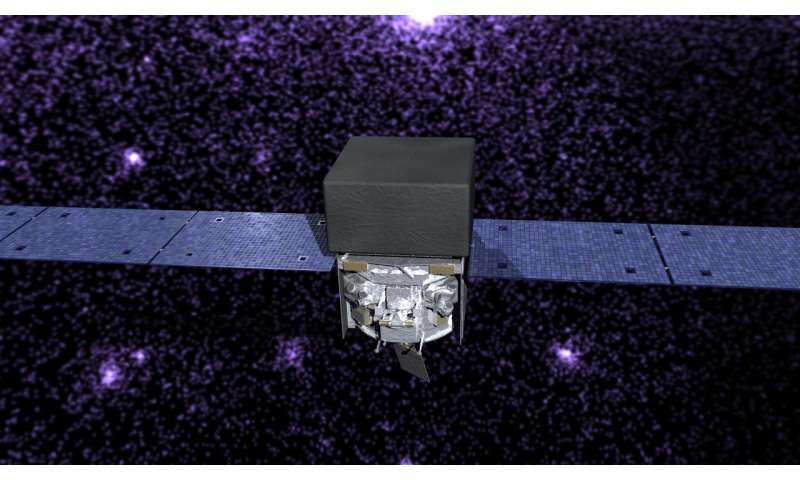 The Fermi team has adopted a new observation strategy to accommodate the jammed solar panel, and both instruments continue to scan the gamma-ray universe. "The Fermi observatory has so much flexibility that this glitch has only minor impact on science operations," McEnery said. "Fermi is well prepared to continue operations for many years, and we look forward to many more discoveries about the high-energy universe."